The work of Gayane Sargsyan, a resident of Aygek village, Armavir region, has been running for 10 years early spring and ends in mid-autumn. She works in the field of agriculture, is engaged in seasonal work. “As soon as the agricultural season begins, I already have a job: I am engaged in collecting various crops, beans, strawberries, apricots... My working year begins with the harvest of beans, and then I collect different vegetables, fruits and berries in turn. Well, my job is not easy, but I have no alternative, it’s difficult to find a job in the village. If I didn’t have these seasonal jobs, I would be completely unemployed”, says Gayane. Gayane works on a daily fee. The working day lasts 8 hours, but during it she also has the right to rest. She earns a salary of 5,000 drams (about 9 euros) for a day's work. “My employer and I mainly work on the basis of a verbal agreement, we don’t sign a labor contract, but there hasn’t been any problem so far. I have been working for the same person for many years; he has always paid my salary regularly, and I do my job responsibly”, says Gayane, adding that she is the only employee of her household and that she feeds a family of 5 people. “It is very difficult to find another job except a seasonal one in the villages. Most rural population goes to work abroad, and mostly the men go. That is, if you're a woman and you've lived in the village, you have to sit at home, or do seasonal work, or think and start your business, which is very difficult. I know very few successful businesswomen”, says Gayane. 30-year-old Hripsime Petrosyan lives in Krashen village of Shirak region. Just three years ago she was known as a shy and timid girl in the village. Today she has found a stable job not only for herself, but she also thinks about her fellow villagers. “About 6 years ago a training course was organized in our village by 'Women for Development' NGO. I took part in it, and then I took part in another training course; I began to go out of the village and participate in various projects. Gradually my life and worldview changed”, says Hripsime. Thanks to the participation in such projects, she received 2 million drams by means of the grant program announced by the “Kasa” foundation, by which she bought a tractor. “There was a point in the program saying that the money was given to relieve the burden of the community. And I bought a tractor. Many people rejoiced, because they were doing field work by hand, and with my tractor I was a real savior for the peasants. I was also happy because I was providing myself with work. True, at first it was unusual for me to be a tractor driver in our traditional country of Armenia where they say that the place of a woman is the kitchen, but now I cannot imagine myself without a tractor”, says Hripsime. The fact that Hripsime became a tractor driver was easily accepted by the villagers, because she had already started driving an UAZ car before that. “I was driving my dad's car. Many people looked at me in the village, as it was very unusual. Gradually they got used to my image; after I sat down on the steering wheel of the tractor, they just smiled”, recalls the girl. 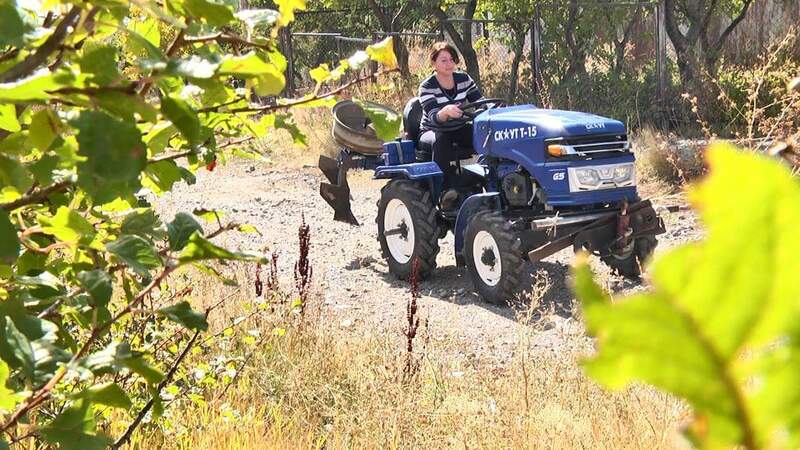 Hripsime provides agricultural services also to neighboring communities with her tractor. She says she is satisfied with the current life; she already has a stable income, and in the past she could only dream about such work. “I collected money and set up a children's playground in our village. It was still a childish dream. My fellow villagers also dreamed about that playground. Now the children of our village play there, and tomorrow my child will play”, says Hripsime, who is still unmarried, but dreams of building a strong family and having a baby boy. Hripsime does not only drive a tractor but is also actively engaged in social activities. “Our women are very passive. I try to involve them in various projects, also bring projects to our village through which we can create a workplace, live an active life. The life in villages is very sad, we must add colors in our lives; we must also create a workplace for us”, says Hripsime, noting that if you live in the village, it does not mean you should stay at home and only deal with your household. The lack of jobs in rural areas has led to the migration. A part of young men is currently looking for a job abroad. Although there is no clear data on how many people go abroad, in some rural areas of Armenia it is difficult to find a young man in the middle of the year. “There is nothing to do in our village; every year in January, my husband goes to work abroad and returns in December. It turns out that I see my husband only a month during the year”, says Rima, a resident of Gegharkunik region. The regions of Shirak, Lori, Gegharkunik and Kotayk are the most affected by migration processes. “I have always dreamed that I wake up in the morning, take my children to school, go to work, and then at home they tell me about their lessons at dinner, and I share my impressions of the working day. It has remained only a dream. There is not even a small factory near our village where I could work”, mentions Rima. Rima has decided to move to the capital Yerevan next year, saying that she has already spoken to her husband and he agrees. “Instead of working in Moscow, capital of Russia, my husband will work in Yerevan, capital of Armenia. Before it was difficult, you had to pay a bribe or have a good acquaintance to find a job, but now there has been a change of power in our country, I think at least we can find a job in Yerevan”, says Rima. The problem of unemployment is of concern to the Armenian government, which has been implementing a number of programs in the past several years to solve it – for example, the project: “Providing agricultural economic assistance through seasonal employment promotion”. Also, together with international organizations, steps are being undertaken aimed at developing small businesses in different settlements of Armenia. This should contribute to alleviate the unemployment problem. Also, after the change of power in the spring of 2018, the issue of unemployment was touched upon in a new government program, which says: "The non-violent, velvet, people's revolution in Armenia in April-May 2018 resulted in economic and investment positive expectations. The government intends to direct investments to the regions and encourage the investments which are aimed at creating the largest number of new vacancies”.